Happy people make happy companies. We at Sri City understand this well. The social infrastructure we have developed at Sri City leaves no stones unturned in making the life at Sri City a wholesome experience. From well-planned housing to advanced healthcare, education, entertainment and convenience, we have made sure your employees enjoy their every minute at Sri City. 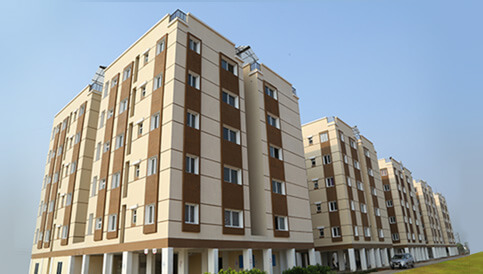 Sri City offers various housing options, from serviced apartments, town homes, independent villas, budget housing to luxury villas catering to the diverse requirements of its occupants. For entry-level workers, provisionhas been made for 600 units in 3 different locations. Each unit is 350 sq. ft. permanent building with water, power, sewage connection etc. The Medical Centre at Sri City is established in collaboration with Frontier Life Line Hospital. 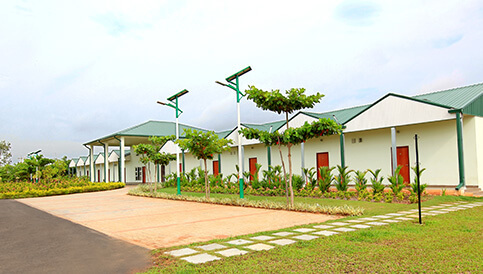 The centre was established to serve the medical needs of the employees and people in the surrounding villages. The medical centre comprises of Frontier Life Line Hospital, Sankara Nethralaya, Adriya Wellness Centre, Syncremedies Ayurveda and Care Super Specialty Dental Clinic. The Frontier Lifeline Hospital is a general hospital that offers first aid emergency care from snake bites and industrial injuries. The hospital operates round the clock and deals with industrial injuries like, cut, burn, etc. There are 10 beds in the hospital, out of which 9 beds are used for regular patients and 1 is reserved for dialysis. Equipped with 3 doctors and 7nurses, the hospital takes care of 30 to 40 patients on a daily basis. The hospital has its own lab & X-ray unit, pharmacy, wheel chair and ambulance facilities. In addition, Medical Centre has also commenced emergency care division in Foxconn & Ball Corporation production units. Sankara Nethralaya is a leading eye care hospital and reaches out to local people in the vicinity who have eye related problems. They conduct cataract& Glaucoma operation once a week at an affordable cost. In addition, they also organize eye camps in the Govt. schools once a year. Also, for patient convenience, there is a small optical shop on the floor. Kanchi Kamakoti CHILDS Trust Hospital (KKCTH), a leading tertiary care hospital launched a Children’s Specialty Clinic in Sri City exclusively catering to children’s health needs. Care Super Specialty Dental Hospital provides specialty dental services in Sri City Medical Centre. Adirya Wellness provides occupation health and wellness outpatient services at Sri City Medical Centre. Syncremedies provides ayurveda and homeopathy outpatient services in Sri City Medical Centre. SIMS (SRM Institutes for Medical Science) provides advance life support ambulance services (staffed with a critical care nurse, emergency medical technician and driver around the clock) which will be stationed at Sri City Medical Centre. The education zone in Sri City comprises of schools, colleges, research and training centres in the faculties of arts, engineering, medicine, commerce and business. All the academic institutions established in Sri City have been selected meticulously keeping in mind the requirements of Sri City as well as the responsibilities toward the society. The aim of education is to empower people and make them strong enough to be independent and to provide them with financial stability. Due to strategic location of Sri City (border of Tamil Nadu and Andhra Pradesh) the schools nearby follow Andhra Pradesh, Tamil Nadu and CBSE syllabus. Chinmaya Vidyalaya at Sri City is affiliated to the Central Board of Secondary Education (CBSE) and is located in a completely conducive environment for holistic education of a student. Run and managed by Central Chinmaya Mission Trust (CCMT), it is spread across 24000 sq. ft. of land offering value based education for cohesive development of the intellectual and spiritual aspects of the personality. The school offers education from LKG to 10th standard and at present, the total student strength in Chinmaya Vidyalaya is 640. 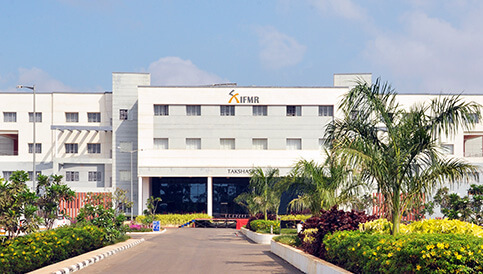 The Institute for Financial Management and Research (IFMR), Chennai, established in 1970 has been ranked the 23rd Best B School in India and 9th Best B School in the Area of Finance. IFMR in Sri City is spread over 40 acres adjoining other proposed prestigious educational institutions inside Sri City. Since its inception, IFMR’s mission has been focused on contributing to growth and development efforts in India with an emphasis on finance and research. Indian Institute of Information Technology (IIIT), the premier engineering institute in India, is set up at Sri City. It is an autonomous Institute setup by Government of India (MHRD), Government of Andhra Pradesh and Sri City as a not-for-profit Public Private Partnership (N-PPP) Society. The institute is run by the Board of Governors of the IIIT Society. The Board of Governors include representatives of MHRD, GoAP and Industry Partners; eminent people from academia, industry and civil society. The IIIT campus at Sri City is spread over 50-100 acres. In addition to above, the students will also specialize in areas of Consumer Electronics, Automotive Engineering, Supply Chain Management, Sustainable Energy, and Aerospace. 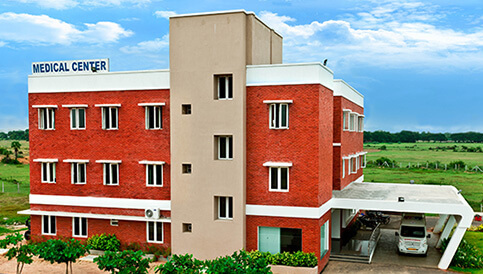 Great Lakes International University is established by Great Lakes, one of the top premier B-schools in India. It brings in an innovative approach to UG education with focus on global outlook, critical thinking and business skills along with emphasis on cutting edge technology areas. At present, the courses on offer are BBA & B.Tech (CSE), approved by AICTE, a statuary body for technical education. Top-notch schools with the globally recognized International Baccalaureate curriculum have plans to cater to the expat community that is expected to grow in Sri City. With MNCs from over 26 countries having already set up base, and with many more keen to join, Sri City is expected to have a significant expat population soon. Located in the heart of Sri City, this business resort encompasses 20 acres of beautiful landscape and is the perfect blend of business and leisure for the discerning traveller.29 rooms for executive boarding and lodging premium accommodation options, along with banqueting facility, multi-cuisinerestaurant and recreational activities for short stays are available. The Inn continues to cater to a growing pool of visitors by providing exemplary boarding and lodging facilities. The Inn comprises of 10 fully furnished rooms with Wi-Fi and DTH, and upholds round-the-clock services. The multi-cuisine restaurant caters to the varied palates of its international guests. Eat Street is a ‘Quick Service Outlet’ comprising of independent multi-cuisinefood counters. The outlets also offer a Dial & Dine Service, which is an exclusivedoorstep delivery within Sri City, for no extra cost. The 9000 Sq. ft. Food Court is currently operational inside the Business Centre; itprovides multi-cuisine dining options to its guests. The food court serves breakfast,lunch and snacks, catering to the employees of Sri City and the manufacturing facilities. On December 1, 2016 the State Government accorded approval to upgrade the existing police outpost to a full-fledged police station. The facility is now operational and offers a sense of safety and security to the units, employees & residents of Sri City. SriCity gets its very own “Post office” & “Pin code” and places itself on the postal map of India. The pin code allotted to Sri City is 517646. It is located on the Central Expressway, providing easy access to all the manufacturing industries. The post office will offer all the conventional services including special services like speed post, business/express parcel, transport & logistics post, e-post, postal life insurance (PLI), free pickup, door delivery, etc. There are plans to introduce ‘Motor Mail Services’ between Sri City-Tirupati-Nellore-Chennai very soon. Sri City has a fire station , located on Central Expressway. For the benefit of all the manufacturing industries, to combat any fire incidents. The fire station is equipped with latest model fire tender and five firemen for a better response capability. Apart from that, there are 3 ATMs in Sri City provided by IOB, SBI and ICICI Bank for swift monetary transactions.